In My Mailbox is one of my favorites memes and it's hosted by the lovely Kristi at The Story Siren. I got one non-Cybils book in my mailbox this week and I'm very excited about it! 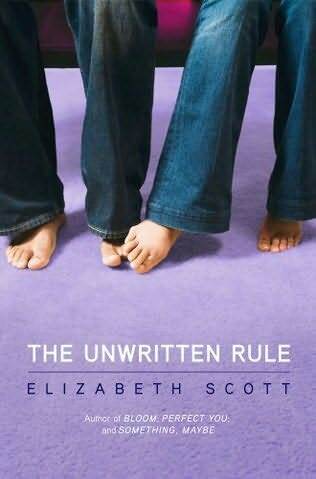 The Unwritten Rule by Elizabeth Scott. Simon Pulse, April 2010. Sarah has had a crush on Ryan for years. He's easy to talk to, supersmart, and totally gets her. Lately it even seems like he's paying extra attention to her. Everything would be perfect except for two tiny details: Ryan is Brianna's boyfriend, and Brianna is Sarah's best friend. Sounds like another awesome read from Elizabeth Scott! I've enjoyed her Perfect You, Something Maybe, Living Dead Girl, and Love You, Hate You, Miss You. So happy to find this one in my mailbox... What was in YOUR mailbox this week? I love Elizabeth books! I can't wait 2 read this one! Happy reading!! I am DYING to read this one. Can't believe it's so long until it comes out.